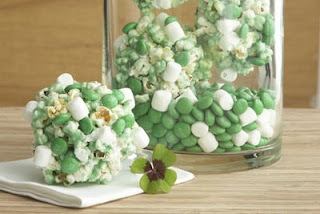 Okay, how cute would this be as a gift for St. Patrick's Day? Found at Treasure of Memories. "Lucky You...to be married to ME!" You can find these plastic paint cans at most craft stores...I've seen regular and mini sized at Michael's Craft Store. 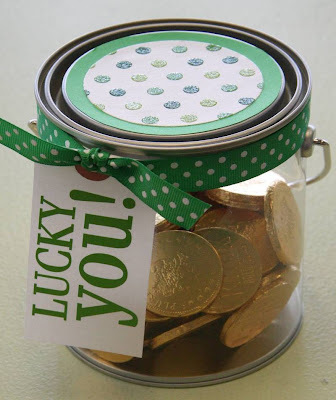 Tip: I've found that gold chocolate coins can be really expensive. Substitute for Rolos and you get the same effect. The leprechauns found his shoes and left some leprechaun loot! I popped this into my husband's backpack and he found it while sitting in class... Nice Surpise? I'd like to think so. Studio 5, a mid-day show in Utah, has some clever ideas as well! Super Cute Ideas! I love the paint can, may have to give that one a whirl! So cute! I love the idea of the lephrchaun finding his shoes. :) My husband would love that! I love the idea of the green candies in her shoe! I'm going to do that for sure! i love this!!! pioneer party is wonderful! Thanks for the idea! I made my boyfriend a "pot of gold" and left it in the mailbox for him to find in a few hours!